If it’s Harryhausen, it’s good; that’s a general rule for anyone to live by. 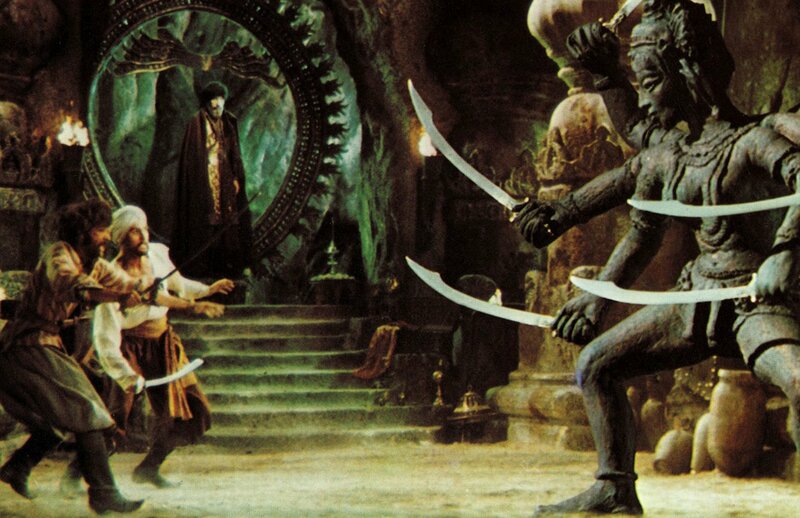 This is Harryhausen and it is good – but it’s also quite tacky and seriously outdated. However, we can forgive the science, and all the other fluff and enjoy a rip-roaring romp of the sort I loved as a child and which are fine introductions to sci-fi and horror to any youngster. A loose adaptation of the HG Wells story it features an interesting story within a story framing. The film begins in 1964 (the time of filming) as the UN has just sent a team of multi-national astronauts to the moon – none of this Cold War/Space Race nonsense. In the early searches of the moon’s surface they uncover a Union Jack already planted. ‘WTF’, they all scream. Further searching reveals a woman’s name. Back on Earth there is a frantic search to find this woman and lo and behold her husband is found – boy does he have a tale to tell. We flash back to 1899 where the man and his wife are planning their life together before meeting an excitable old inventor – Cavor. Before long the three of them find their way to the moon and are bewildered to find creatures already living there. The English inventor wants to engage with them, learn and teach, while the Yank wants to kill them. 1899 or 2017 – you decide. And so we see Bedford tell his tale – there are moon cows, wobbly aliens, and ancient collapsing structures. There is a sense of wonder at it all, which should still stir up questions and interest in kids – I watched it, or most of it with my eldest daughter who moved between being bored, freaked out, wanting to turn it off, and wanting to watch it later. For all the hokey effects as viewed through our modern stained eyes, we see the film’s other merits – a sort of political discussion, a sort of enthusiasm for science and exploration, and Lionel Jeffries hamming it up. It does take a while before we get to the moon, and it would have been nice to see what happened in the immediate aftermath of Kate and Bedford returning home, but these gripes aside it’s still an interesting snapshot of both Victorian error sci-fi and what people pre-moon landing made of it all. Let us know in the comments if you have seen The First Men In The Moon and what you thought of the movie. Official Nominations: Cleopatra. The Birds. Two entirely different films with two entirely different approaches to effects were nominated this year. Cleopatra’s epic scope in every facet of film-making means that Special Effects were also considered, with Emil Kosa Junior picking up the official win for some terrific matte work. Aside from these shots which show things like Cleopatra’s arrival in Alexandria and breath life into the epic, there actually isn’t a lot else to speak of. The Birds also has a number of famous matte shots, but a number of nice transitions that you wouldn’t normally notice during watching because they are so smooth. 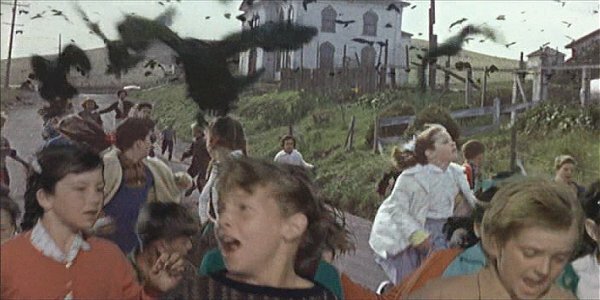 I can mention a number of scenes from the movie, such as the birds arranging on the climbing frame which are a mixture of effects and expert animal handling. Shots like the birds hovering above such scenes as the gas station explosion, the swooping attack on the school kids, and Tippi’s attack in the attic were a mixture of animatronics, trained birds, rotoscoping, and matte work – all superb from Albert Whitlock and Ub Iwerks. My Nominations: The Birds. From Russia With Love. The Great Escape. Jason And The Argonauts. X: The Man With The XRay Eyes. Only The Birds makes it over to my nominations, but it is joined with a couple of true innovators, and a couple of action movie classics. Both The Great Escape and From Russia With Love feature a wide array of action set pieces which required both potent stunt work and detailed special effects, with explosions and chases galore. Corman’s X was on made on a shoestring but is an inventive little thriller with some wonderful effects – from the seedy see-through clothes vision to Milland’s ‘eyes’ to the Spectarama colours and blurring, it’s a treat for effects purists. 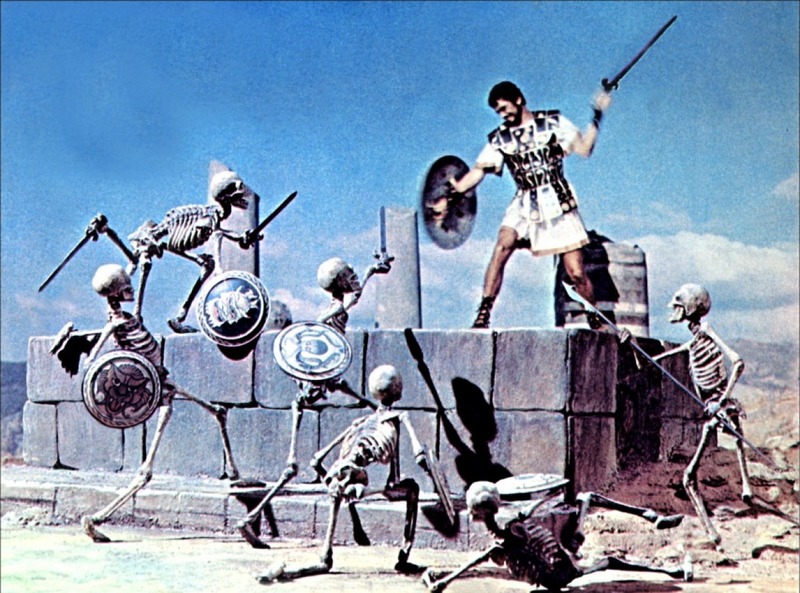 My clear winner though is Ray Harryhausen for his glorious work on Jason And The Argonauts. His assorted creations are given breath as they stalk the characters and terrify the audience, blending seamlessly in to the real life scenery. The first time you see Talos emerge, and the first time you experience the skeleton warrior attack are moments which will stay with you forever. My Winner: Jason And The Argonauts. Let us know your pick for the best Special Effects of 1963 in the comments!